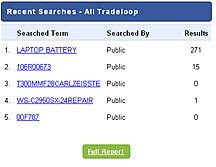 Tradeloop's new Search History report page is a valuable market research tool. The versatile options help you find just the information you need - when you need it! Mix and match the sort options to see all searches by dealers on your inventory within the past 7 days, all searches by public users within the past hour, or any other combination that makes sense for your search. 1. Top searches on Tradeloop: The top five part number searches are displayed. Click on the part number to see which Tradeloop members have inventory. Click on the "who searched" link to see a report listing the date, search term, searcher's identity, and the number of results the search returned. Alternatively, from the main Search History page, you can click on "Full Report" to see a list of the top 100 searches on Tradeloop. 2. 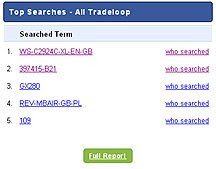 Recent searches on Tradeloop: The five most recent searches are displayed, along with the identity of the searcher, and the number of results returned by the search. Clicking on the "Full Report" option gives you a list of recent searches by date, search term, searcher, and number of results returned. 3. Top searches on your company's parts. Uses the same format as the top searches on Tradeloop report, but only for parts in your company's inventory list. 4. Recent searches on your company's parts. The same format as the recent searches on Tradeloop report, but it returns results only for parts in your company's inventory list. Each report contains a number of sort options and date ranges. For instance, you can limit the results to "Dealers only," "Public only," or "Dealers and Public" searchers. Date ranges are all searches within 7 days, 1 day, or one hour. The new reports benefit both buyers and sellers by making it easier to match buyers looking for particular items with with sellers who have inventory. Dealers can monitor the market, see who's searching on their parts, and accurately price inventory based on supply and demand. Get up-to-date information about searches matching your inventory by setting your email preferences to receive search reports hourly, every three hours, or daily. Just go to your Account page, click on "Email Preferences," select the "Matching Inventory" report and select your preference. You'll immediately begin to receive email reports. You can stop the emails at any time just by unclicking the check box. We encourage all members to visit the Search History page and become familiar with the search functions and options. We think you'll be amazed by the amount of helpful market information contained in these simple, easy-to-understand reports.